We all have the same amount of time on any given day….24 hours. On average adults spend 7 to 9 hours sleeping and 6 to 8 hours at work. Therefore leaving us roughly 6 to 7 hours to squeeze in time for our family, home and if you’re lucky yourself. Since time is so valuable wouldn’t you rather spend as much time doing the things you love? Which leads us to the question “why organize”? The benefit of getting organized will increase your personal productivity and your capacity to get high priority things done so that you’ll have more time to enjoy the freedom to do the things that really energize you. 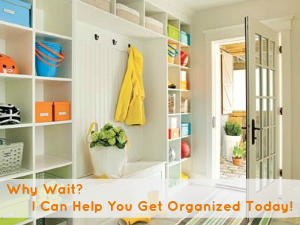 Are there organizing projects around the house that need to get done, but you don’t have the energy or time to complete them? Have you ever imagined how awesome it would be to have a dedicated and trustworthy helping hand for the endless daily responsibilities you face? Have you had trouble maintaining consistent progress on outstanding home projects that you know would make you more effective and efficient if you could complete them? Do you feel like most of your responsibilities are suffering from lack of high intensity attention because you are spread too thin? Do you spend more time looking for the things you need rather than finding the things you need? Are you drained of energy and overwhelmed with responsibilities? Are you constantly being pulled in different directions? If you answered “yes” to any of these questions, can you really afford to waste anymore time not being organized? By hiring a Professional Organizer / Personal Assistant, you will get double the benefit of accomplishing more in your life. Call today for a FREE home assessment visit!